Quick overview Examines the importance of psychological care for ill and injured people. This book gives practical advice to develop health professionals' personal clinical practice by providing a guide to the organization of psychological care and 'coaching' in the essential skills. It is suitable for health care professionals who have regular patient contact. Is the psychological care of patients neglected in hospitals and health centres? What is the impact of this neglect? What type of psychological care is needed and how should it be organized? In this new guide, Keith Nichols examines the importance of psychological care for ill and injured people. The book gives practical advice to develop health professionals' personal clinical practice by providing a guide to the organization of psychological care and 'coaching' in the essential skills. 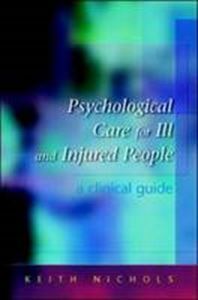 Written in a tutorial style with an emphasis on clinical observation and case material that illustrates the psychological needs of patients and their partners, the book demonstrates that the neglect of psychological care for the ill and injured can undermine progress in treatment and recovery and increase medical costs. The need for urgent improvement is stressed. This book is an essential tool for all health care professionals who have regular patient contact, including nurses, doctors, the therapy professions, and clinical health psychologists.